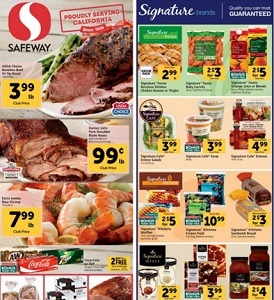 Safeway Weekly Ad Specials, valid April 17 – April 23, 2019. This Week Ad best deals, and grocery savings on: Farmer John Pork Shoulder Blade Roast; Extra Jumbo Raw Shrimp; Signature Farms Boneless Skinless Chicken Breasts or Thighs; Signature Farms Baby Carrots; Signature Farms Orange Juice; Signature Cafe Applewood Smoked Ham; Progresso Vegetable Classics Soup; USDA Choice Beef T-Bone, Ribeye Steak; Signature Farms Chicken Drumsticks, Thighs; USDA Choice Boneless Beef Cross Rib or Chuck Roasts; Alaskan Sockeye Salmon Fillets; Premium Large Fuji Apples; Barilla Pasta Sauce; Green or Red Bell Peppers; Open Nature Grass Fed Angus Boneless Beef Ribeye Steak; Alaskan King Crab Legs & Claws or Langostino Lobster Meat; Organic Grape Tomatoes; Kellogg’s Special K Cereal; Classico Pasta Sauce; Tide Liquid Detergent; Smithfield St. Louis Style Pork Spareribs; Ore Ida Potatoes; Organic Large Hass Avocados; and more. Find all deals, offers, and prices in the latest Safeway Weekly Sale Ad Specials.